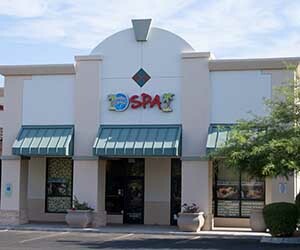 March has flown by here in the Scottsdale spa. We can hardly believe it is already April. The renovations we have done in the spa are going great. Some of the new lighting has already been installed with the rest being installed on April 8th . The lounge furniture has been cleaned and repaired,and brand new comfy cushions have been made especially for the spa by Custom Cushions of Arizona. We have also had our fountain cleaned and restored by Arizona Fountain. Bamboo is being added throughout the spa. It would be much appreciated if you shared your opinion on the changes in a survey. We love hearing from you! We have had two new people join us at the front desk, so be sure to say ‘aloha’ to them. Chris and Makayla are currently in training, but soon they will be able to ensure you are having the best experience possible. This past month, we celebrated Michael’s birthday and Mari’s 2-year anniversary. We also have a VERY exciting announcement coming up soon for the Scottsdale in April!